Isn’t it funny how sometimes husbands help you when you least want it? Wives out there will understand where I’m coming from. And husbands, I concede that all spouses can be frustrating, but on this occasion it was him. This morning I got out early to water the tomatoes, with temperatures expected to be up to 37 degrees celsius. 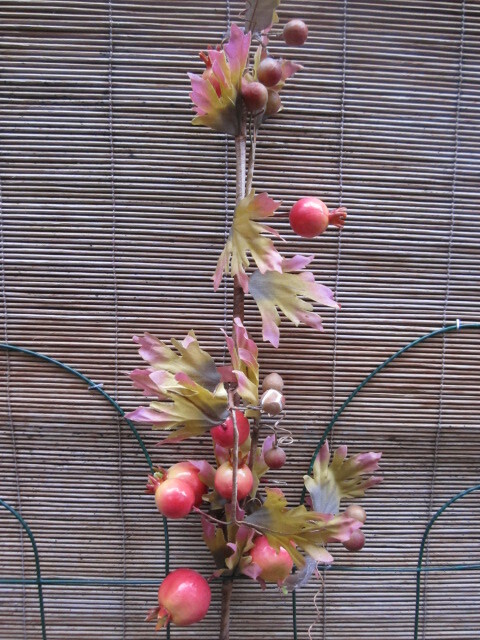 I had just bought a plant from a garage sale and it was on the patio awaiting a new home somewhere in the garden. After going inside for only a few minutes and coming out again, I asked him, “Where did this water come from?” It was trickling across the patio, creating a potential hazard. 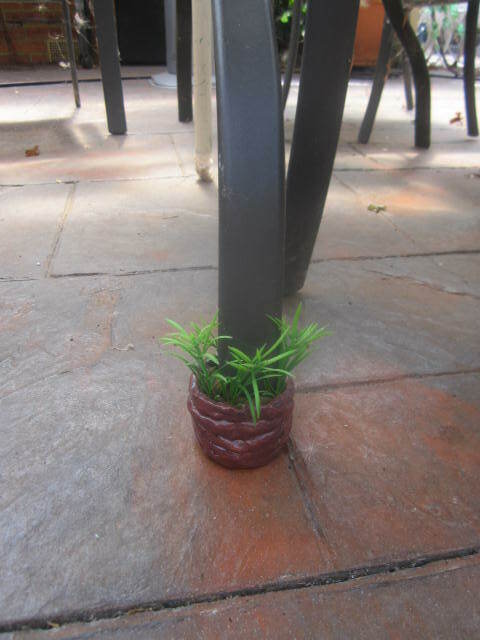 “I just watered your new rosemary plant,” he said, pleased to have been some help. “But it’s artificial!” I exclaimed. Now at least we can all be assured that it is a very realistic fake plant! Do you have a favourite story of helpful husbands? 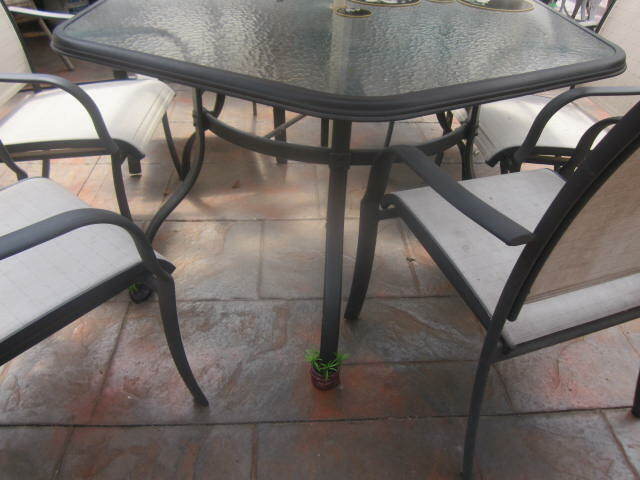 I’ve been tidying up the patio area under the pergola as I continue my tropical makeover. 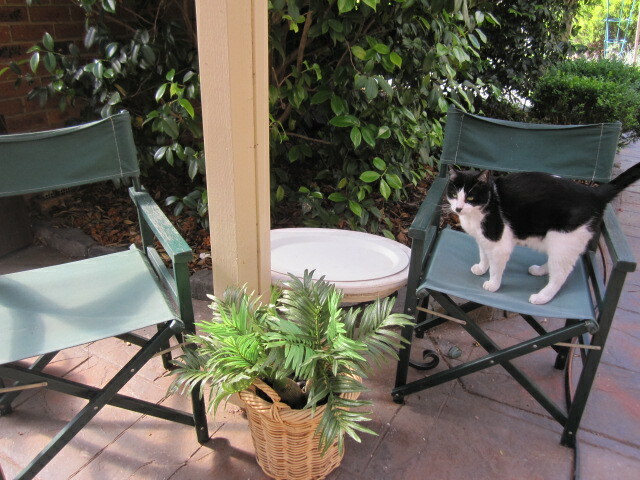 In this corner I have put a couple of director’s chairs, a table and a potted palm. Look closely, and you may see that I will never kill this plant. Yes, it is artificial. In some areas I like to do this – one less plant to remember to water, with a guarantee that it will last years with little or no maintenance, other than an occasional wash.
Then I spotted Zorro, and plonked him onto the chair to add a bit of life to the photo. It could almost be one of those “spot the difference” shots. Though extremely functional, sheds can be quite plain to look at. 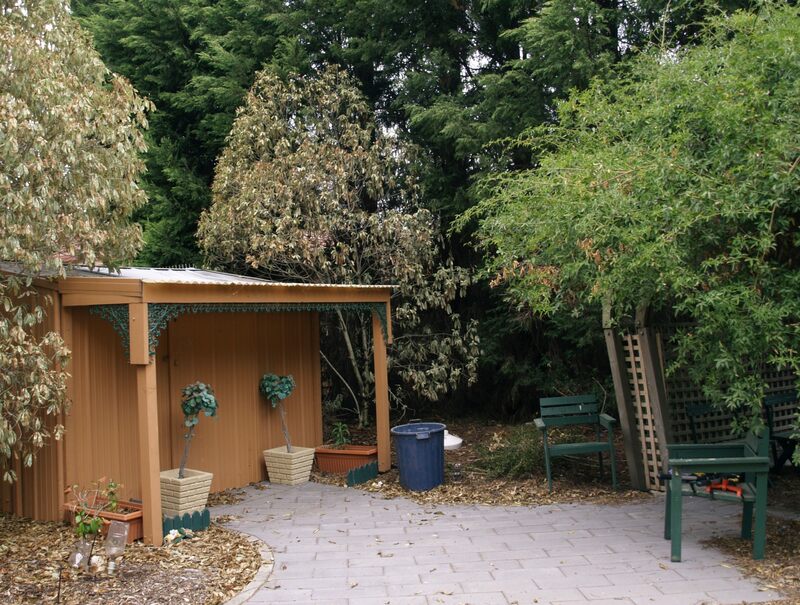 I decided to give ours a facelift, so I enlisted the help of my husband, to construct a nice little verandah for it, utilising some leftover timber and roofing from the original pergola after it was replaced. A couple of artificial plants in pots and a coat of paint, which my visiting sister helped with, and the shed received a lovely transformation into a little cottage. It sits nestled between the trees in the middle tier of the garden. 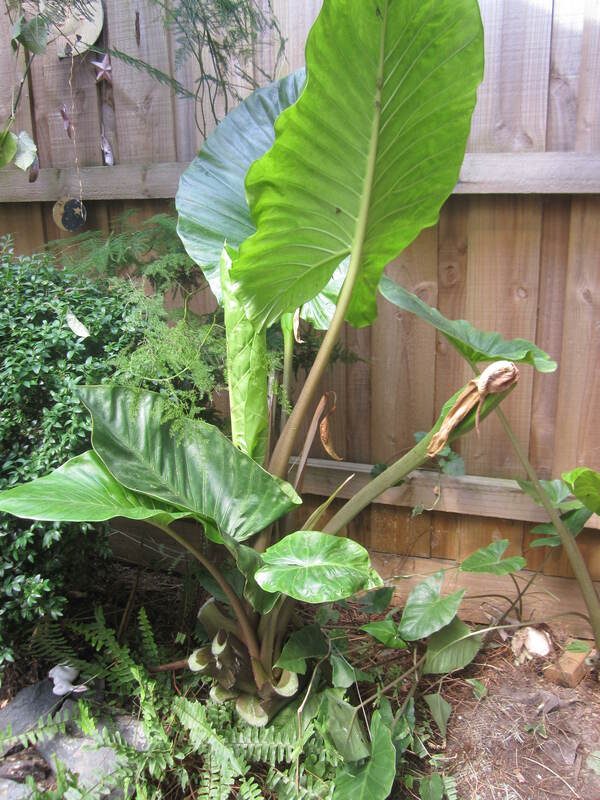 Where the elephant ears had taken over the garden at the edge of the patio next to the garage, was a perfect spot for another little transformation. 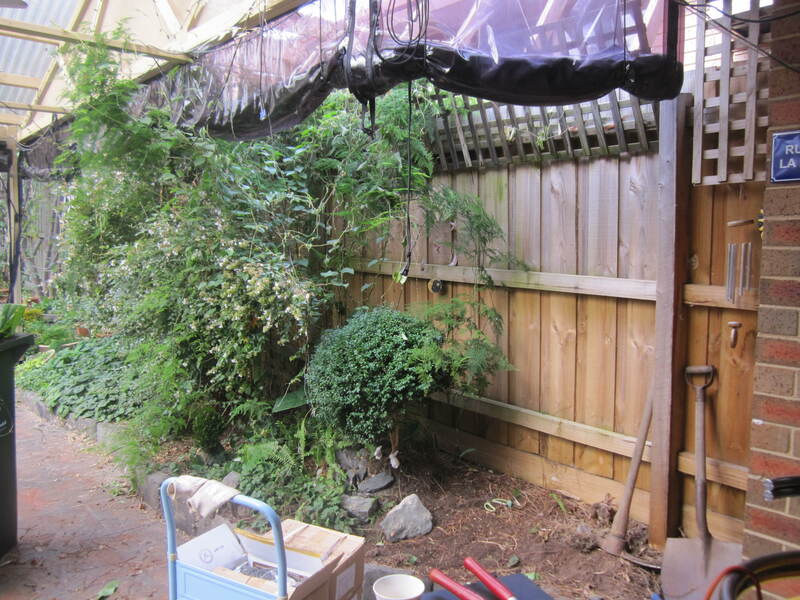 They were so overgrown that not only did they obscure the English box but created a place for water to run down the leaves onto the patio, which defeats one of the reasons for having a pergola, (to protect it from the weather). For some days and a fair amount of toil on my behalf, I even managed to move one of the large rocks from up in the back yard by using a trolley. The other larger rock needed more strength, which is where my husband came in handy. I put a fake plant in the corner under the eaves so that I don’t have to water that area. Adding some little black river pebbles mixed with some slightly larger ones, the job is finished, and I am happy. I am not afraid to have a little artificial help. After all, I do the same for my body. I wear makeup to enhance my appearance; hair colour helps too. 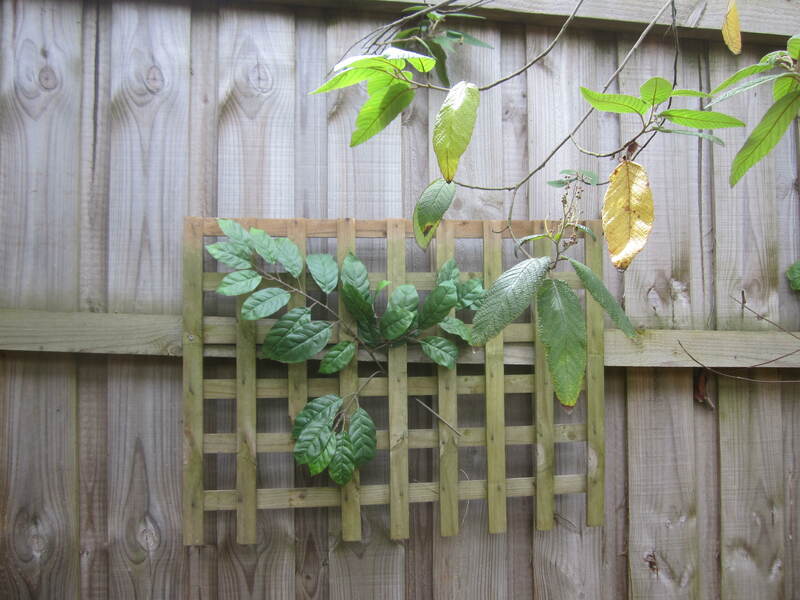 Push-up bras help fight age-related gravity so why not do something similar for my garden? However, I don’t suggest putting underwear on your plants, nor makeup. Once again, there is a little corner that is in a sheltered position. How many corners can one have in a garden? It is next to the laundry steps leading down to the under cover washing line. There were a couple of ugly copper pipes from where the original hot water service stood, until we did an extension on the house. How could I cover that up? Utilising some old plumbing pipes, I painted them and added some artificial tropical plants. 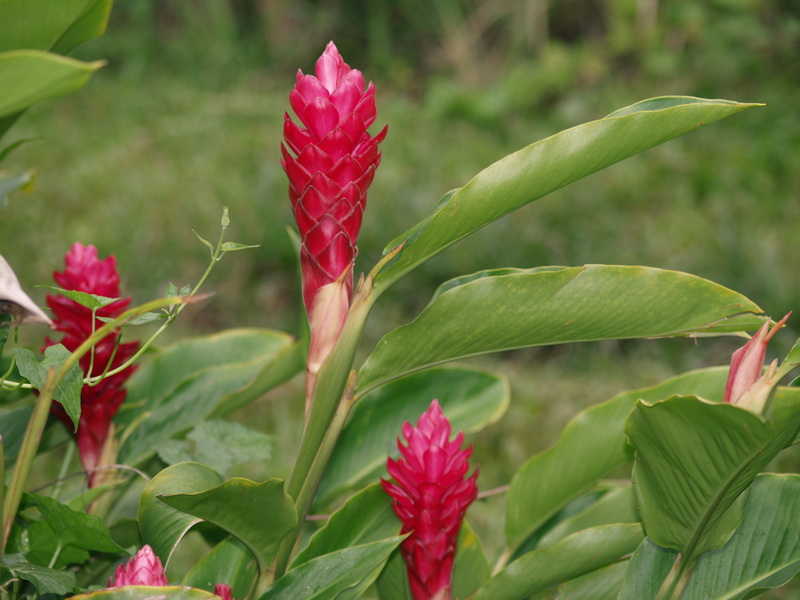 Funnily enough, when we went on a cruise a couple of years ago I took a photo that reminded me of these very same plants. It was taken on a Princess cruise in the South Pacific in January, 2010. So perhaps this is art imitating life? Look at the two photographs and see if you can spot the fake. 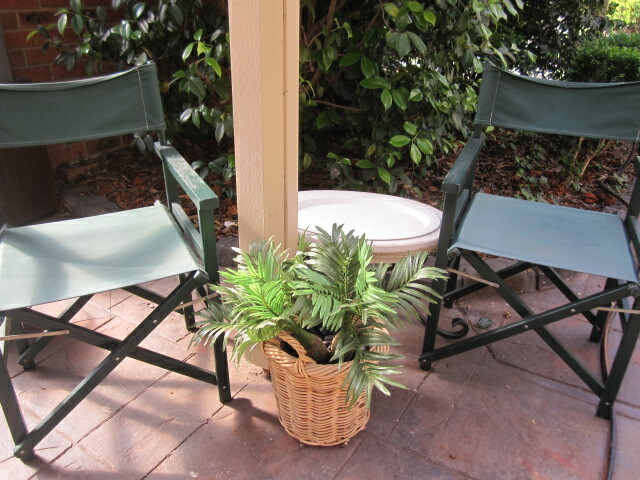 The large fern sits in the corner of the patio and has led a charmed life. 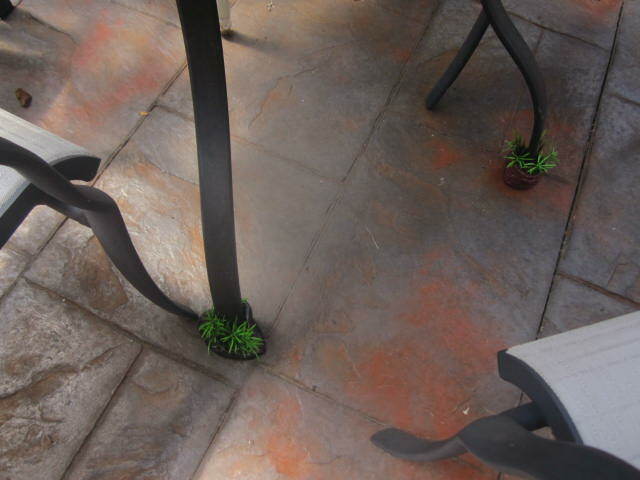 Although it is under the cover of the pergola, it gets enough light to flourish. Occasionally I will give it a large drink by putting the hose into its centre and watering it for half an hour. Over the summer months I might follow this procedure four or five times, and at other times of the year maybe once a month, but it seems to have worked. Hopefully I’m not jinxing it by stating that. I have often used some artificial help in the garden. 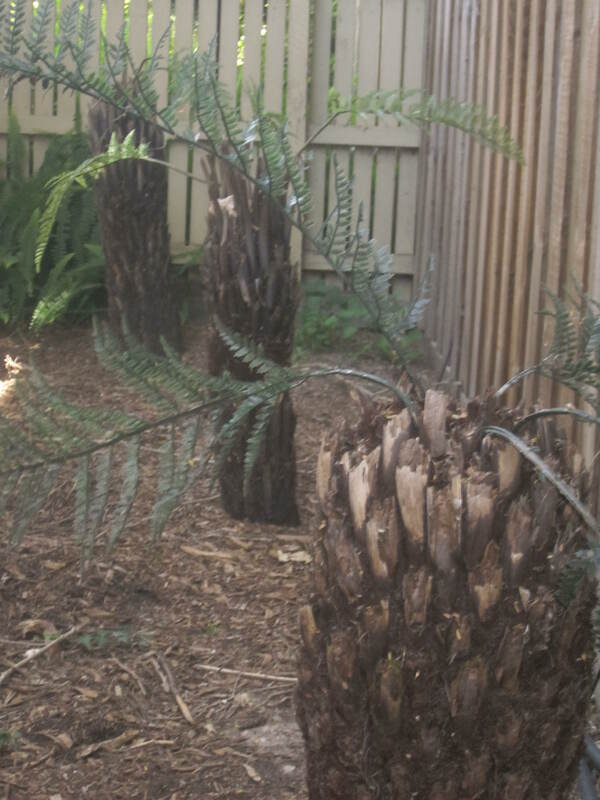 In this case, the tree ferns you can see have had some cosmetic surgery. 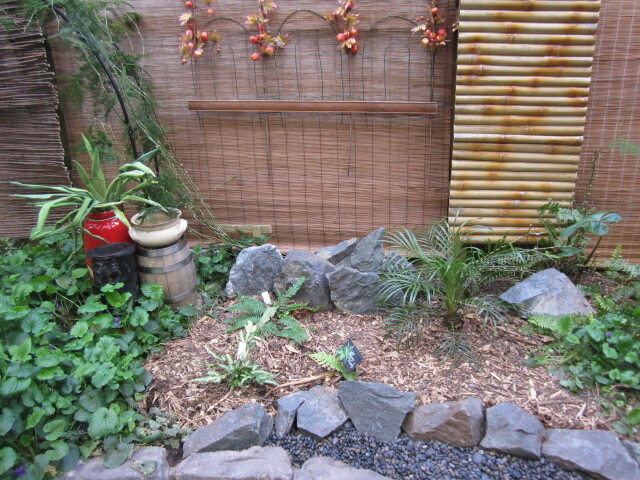 Originally, they were planted down the “dead” side of the house, or the utility area where the washing line is located. 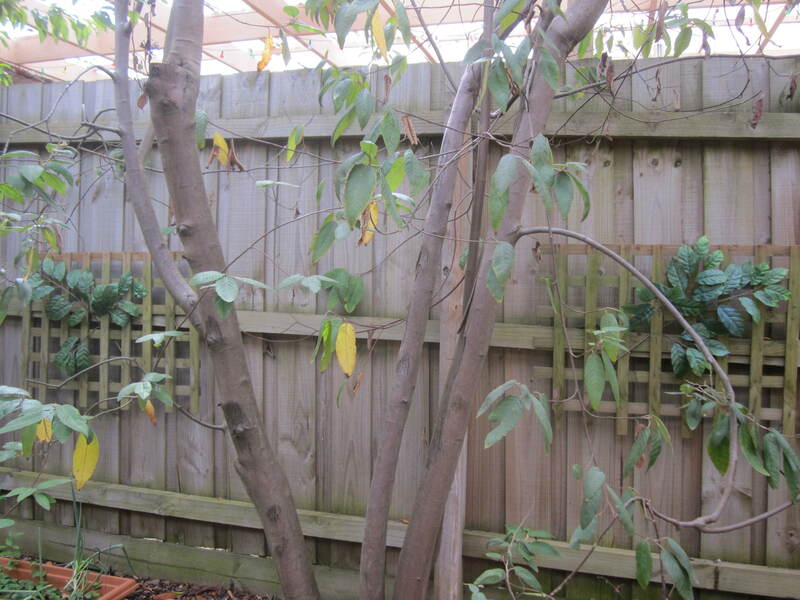 It is a fairly sheltered area because of overhanging native trees next door, which monopolise any rainfall. 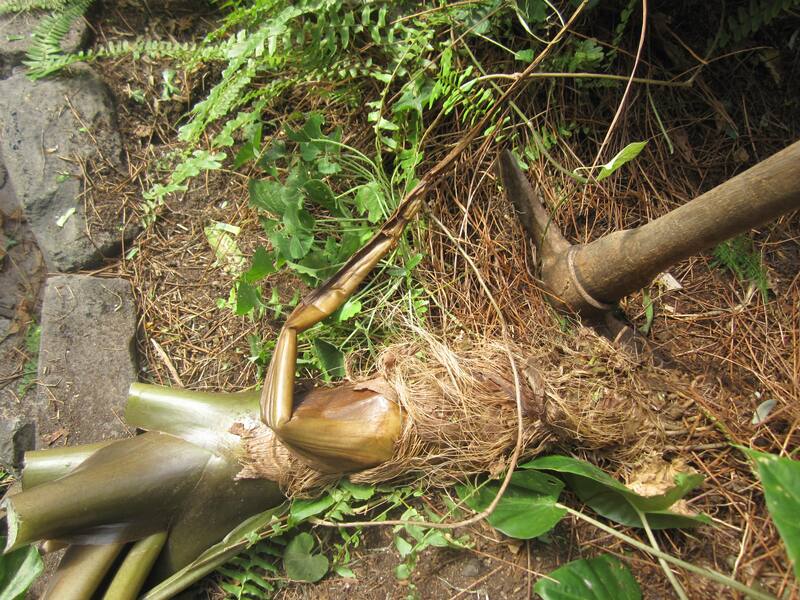 Consequently, the ferns died, and I was left with the trunks. 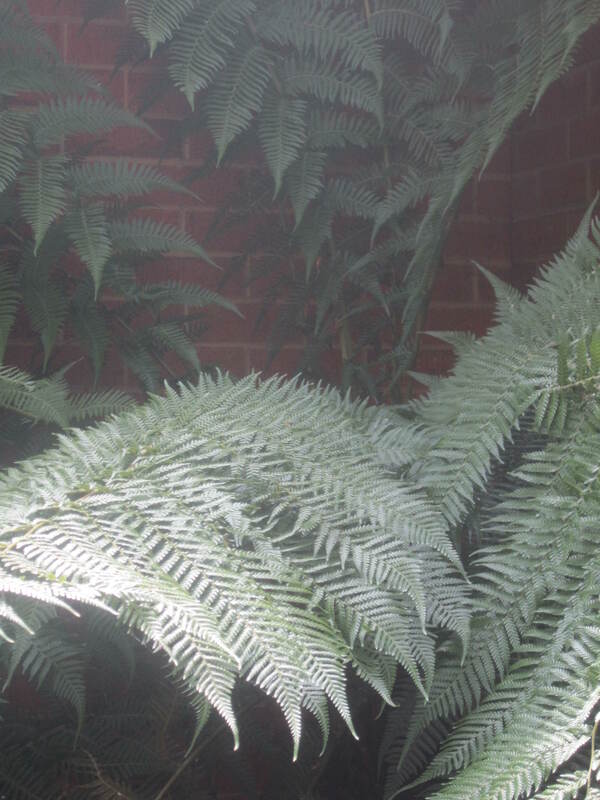 Fern trunks are pretty by themselves, but some greenery finishes them off. 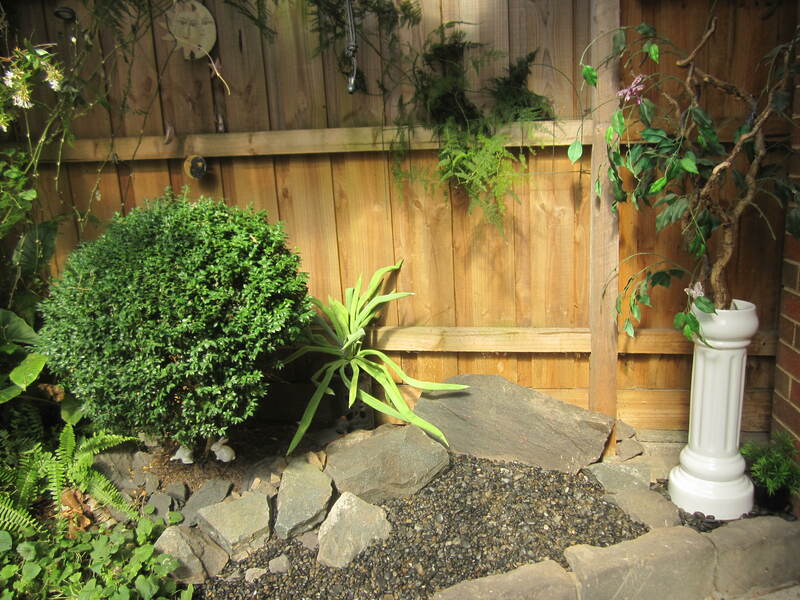 A lot less expensive than replacing the ferns, I purchased artificial fronds and embedded them into the ferns. From a distance you would hardly know the difference, and if I hadn’t let you into this little secret, you would be none the wiser. 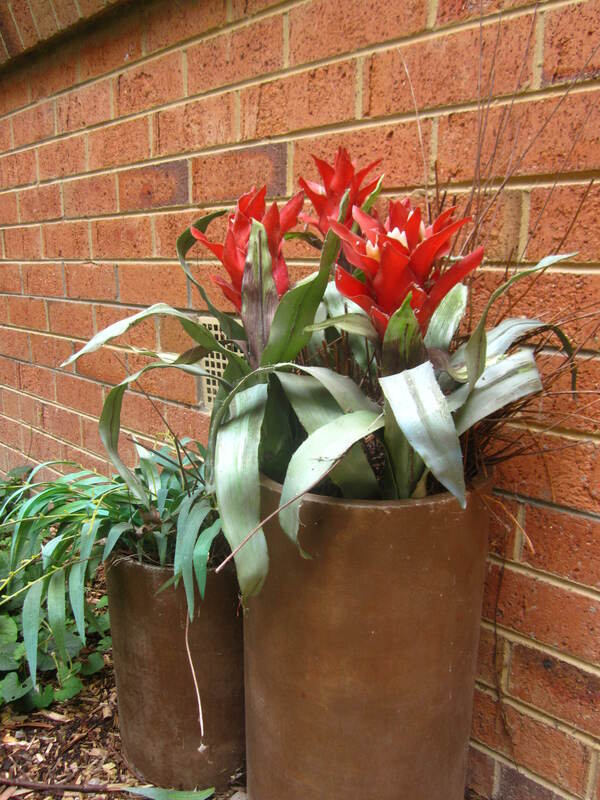 Feel free to copy the idea in any little corner of your garden that needs brightening up without the hassle of watering. Shh!